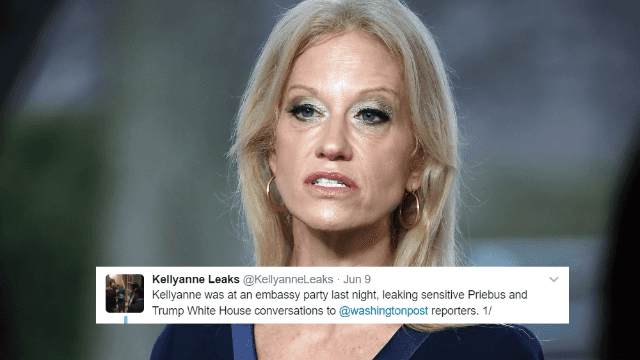 Someone overheard Kellyanne Conway trashing her boss at a party and tweeted the whole thing. It's happened to the best of us: you have a little too much to drink at a party and decide now would be the perfect time to break out the unflattering impression of your boss. But if you're an extremely well-known and prominent member of the White House staff, you should probably know better than to openly air your professional dirty laundry to strangers at a party. And if you still truly can't resist trashing your bosses and colleagues in public, maybe don't do it openly in front of an eavesdropper who's enterprising enough to not only take copious notes and photos but to start a new Twitter account dedicated to documenting your comments. But alas, Kellyanne Conway has never been known for her rational decision making. The counselor to President Trump was caught discussing sensitive information and insulting prominent members of the Trump administration at a DC party this week. It didn't take long for her indiscretions to end up quoted on a Twitter account aptly called Kellyanne Leaks. You can read all the quotes from the party here. Just goes to show you even if there's not a microwave in sight, people are still listening.